Interwoven throughout the study is the invitation to embrace how deeply readers are loved by the Father and to reject the notion that loving God completely is impossible for real women with very real shortcomings. Inspired to reach beyond themselves toward the Father's hand, women will gain a deeper understanding of what their lives could be like loving God with all of their heart, soul, mind, and strength. 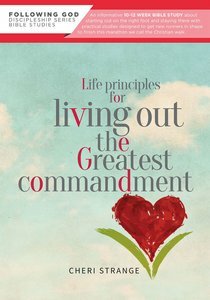 About "Life Principles For Living Out the Greatest Commandment"